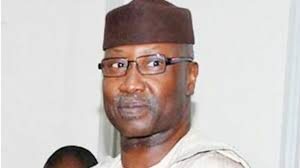 By Sadiq Umar – The Secretary to the Government of the Federation, Boss Mustapha, has declared that governing board of a federal agency or parastatal has no power to remove the chief executive appointed by the President..
Mr. Mustapha’s reaction is coming on the heels of the controversial return to office of the Executive Secretary of the National Health Insurance Scheme (NHIS), Usman Yusuf, after his suspension by the NHIS governing board over allegations of corruption. Mr. Yusuf is believed to be enjoying the support of some powerful persons in the presidency after he had rebuffed his suspension twice. According to the SGF, who spoke at the induction ceremony of the governing board members of federal parastatals, universities and medical centres at the Transcorp Hilton, Abuja, Monday said the board may however articulate infractions, investigate wrong doing and make recommendations to government through the supervisory ministry. Earlier, Chairman of the NHIS board, Ifenne Enyanatu, had announced the indefinite suspension of the Mr. Yusuf, eight months after a similar suspension by the minister was overruled by President Muhammadu Buhari. Prof. Enyanatu said the governing council resolved to suspend Yusuf because it had received several petitions against the NHIS boss. She said the board had the permission of the minister of health to suspend Yusuf, pending investigation. The NHIS boss, escorted by armed policemen had ignored the suspension notice last week, forcing his way into the premises of NHIS despite staff’s protest to the contrary. But Mr. Mustapha while speaking at the DFID organized program, said government was concerned that most governing boards have not understood their roles in the corporate governance of the agencies they superintend.